I know this post should have been published a couple of months ago but I think it is still relevant going forward. "The Senate approved a historic rules change on Thursday [Nov. 21, 2013] by eliminating the use of the filibuster on all presidential nominees except those to the U.S. Supreme Court. Invoking the long-threatened “nuclear option” means that most of President Barack Obama’s judicial and executive branch nominees no longer need to clear a 60-vote threshold to reach the Senate floor and get an up-or-down vote." Yes, Majority Leader Senator Harry Reid, D-NV, pushed the nuclear option breaking a long standing tradition of the United States Senate of 60 votes needed for cloture on judicial nominations. The Democrats, with Barack Obama as president and with a 55-45 majority in the senate, didn't want to follow the senate rules anymore and allow those "mean" Republicans the chance to block any of Barack Obama's nominees. Damn the rules. In 2005 with the situation exactly reversed, with Republican George W Bush as president and the Republicans in control of the Senate 55-45, the Democrats held up many of president Bush's judicial nominees and because the Democrats threatened more filibusters there was a call by some in the GOP to go to the nuclear option, just as the Democrats have done under Harry Reid. Senator John McCain led the effort to shut down any talk of the nuclear option by forming the "gang of 14": 7 Democrats and 7 Republicans that pledged to vote together and prevent the nuclear option [of only needing a majority of 51 votes to stop any filibuster for the nomination of judges, instead of the long established rule of the senate that 60 votes needed for cloture and allow a vote]. Because of Senator McCain's passionate plea and his establishment of the gang of 14, the effort by some in the GOP to go for the nuclear option was halted in its tracks. One of Senator McCain's main reasons that the GOP should not resort to the nuclear option was that one day the Democrats would be in power in the Senate with a Democrat president and Republicans wouldn't want the Democrats to use the nuclear option against them. Well, guess what Senator McCain. Your naivety has been exposed. 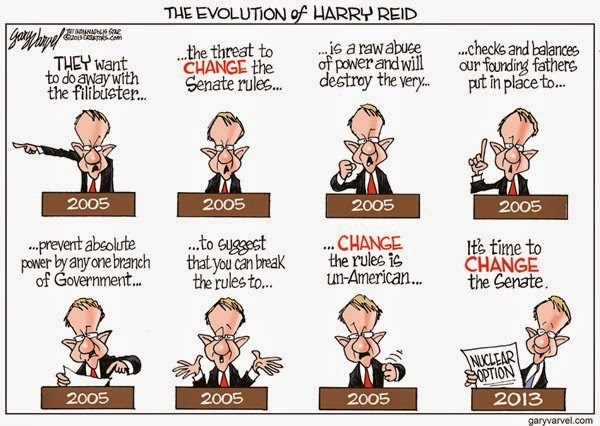 The tables have turned and Senator Harry Reid and the Democrats didn't give a damn that you were fair with their side. As soon as they got in power, to hell with the rules. Yes, Harry Reid and his band of merry outlaw Democrats laughingly blasted the nuclear option and now the GOP cannot stop any nomination, even if all 45 unite together. Here is my question. Where the hell is Senator John McCain now? Where is the passion now that he showed then when he blasted the GOP for trying to go for the nuclear option. Senator McCain you wanted to shut down the senate rather then allow the GOP to "not be fair" and go for the nuclear option. Why can't just one time Senator McCain show the same passion against the Democrats that he is never shy about showing against his own Republicans? Where is Senator McCain threatening to shut down the senate until the Democrats remove the nuclear option they established? Mark my words, you heard it here first. The Republicans will gain control of the Senate again and that is when you will have Senator John McCain join with Democrats again to form another gang to stop what he conceives is some "unfair" action by the GOP. The passion will suddenly return to the Arizona senator. And what will be one of Senator McCain's reasons for joining with so-called "moderate" Democrats to stop the Republicans. That one day the Democrats will be back in control--yes, back in control TO BREAK THE RULES AGAIN. I believe that Senator McCain will prove that naivety is an incurable trait. Let us hope that the rest of the Republican Party has learned a lesson. Fairness in a liberal Democrat's mind only counts when the Democrats are out of power. When the Democrats are in power, fairness and rules to protect the minority don't matter anymore. I know, I recently did a post for conservatives to stop throwing around the term RINO so often because its overuse renders the word meaningless. So, heeding my own advice, I won't call Senator McCain a RINO. No, when I think of Senator McCain, useful idiot comes more to mind.